- Both of the above organisations exist to protect foreshores, dunes, beaches and swell of waterways and surf beaches, for all users of these key Gold Coast environmental and economic assets. Mr Jim Wilson, Chair of SOSBA and RBSA said today, "Like others reported in the Gold Coast Bulletin, I was shocked to learn that Mayor Tate has written to the State Government about dredging the sand bank at the entrance to Currumbin Creek, better known as "the Alley." The Mayor has not consulted the community or, if he has, it certainly has not been anywhere near wide enough on such an historically-important environmental issue. 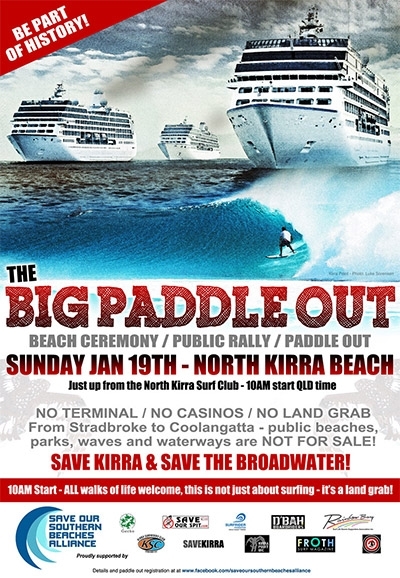 SOSBA was set up to protect the southern Gold Coast surf beaches and Mr Tate well knows where we are, given that we have just completed a protest rally of 4,000 people on North Kirra Beach, to successfully oppose a casino and/or a cruise ship terminal there." "Obviously the stand-up surfing community has massive concerns with this. We understand and support them. However we also speak for the families and other users who crowd not only the Alley, but also the northern and southern beaches of Currumbin Creek back to the MI. This is an estuarine playground of immense significance to both Palm Beach, Tallebudgera and the southern Gold Coast. Our concern is that, if the dredging occurs, it will increase the speed of tidal flow and height of storm surges, leading to the desecration of the beautiful and expansive beach amenity of Palm Beach Parklands and the whole of both sides of Currumbin Creek, right back to the MI and beyond. Since the mid - 1800s, Currumbin Creek has never been designated as a navigable waterway, and we are deeply concerned at the environmental consequences of playing with nature like the Mayor proposes." Mr Wilson said. Mr Wilson went onto say," We call for an immediate, ramped up, full-and-frank community consultation of both up-stream and downstream stakeholders in and around Currumbin Creek, including the tabling of a full environmental impact analysis covering a whole range of concerns, including the ones I have mentioned, as well as the predicted effects on the revetment walls of properties in Currumbin Waters. 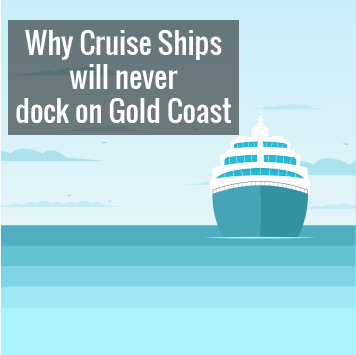 This seems to me to be a rerun of the argument about dredging the Broadwater for a cruise ship terminal and we aren’t prepared to take any chances down this way, as we have a wonderful lifestyle exemplified by our natural assets." Mr Wilson concluded by saying, "We have spoken to Friends of Currumbin, which has been active in the science and protection of the Alley and the Creek for 3 decades and even they weren’t consulted by the Mayor, or Council officers. Many in the community are starting to seriously query the Mayor’s style of imposing his ideas on our community. It is distracting, divisive and time consuming for the community to respond to things after they have become a fait accompli and published in the newspaper. Better to put proper community consultation processes in place up front, to preserve our wonderful sense of community on the Gold Coast."